Whether more changes are required. Whether changes should be merged into another branch. You can comment on an overall commit, a file in a commit, or a specific line or change in a file. For best results, use commenting when you are signed in as an IAM user. The commenting functionality is not optimized for users who sign in with root account credentials, federated access, or temporary credentials. You can use the CodeCommit console to view comments on a commit. In Repositories, choose the repository for which you want to review comments on commits. In the navigation pane, choose Commits. Choose the commit ID of the commit where you want to view any comments. The page for that commit is displayed, along with any comments. 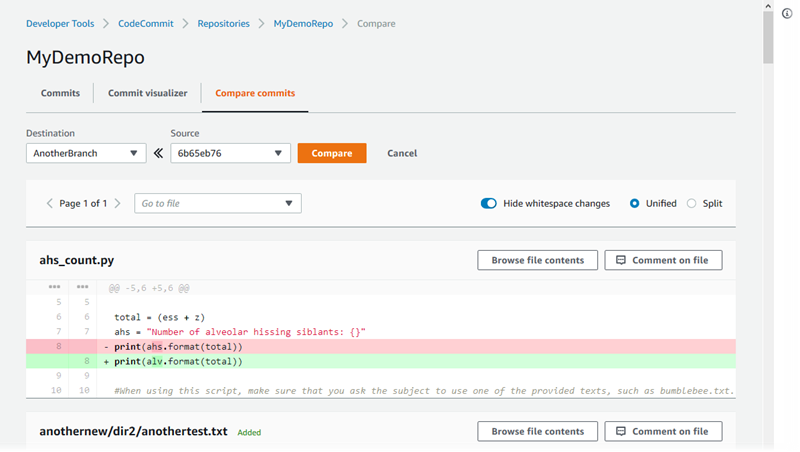 You can use the CodeCommit console to add comments to the comparison of a commit and a parent, or to the comparison between two specified commits. You can also reply to comments. You can add and reply to comments to a commit. Your comments are marked as those belonging to the IAM user or role you used to sign in to the console. In Repositories, choose the repository where you want to comment on commits. In the navigation pane, choose Commits. Choose the commit ID of the commit where you want to add or reply to comments. To add a general comment, in Comments on changes, enter your comment, and then choose Save. You can use Markdown, or you can enter your comment in plaintext. To add a comment to a file in the commit, find the name of the file. Choose Comment on file, enter your comment, and then choose Save. To add a comment to a changed line in the commit, go to the line where the change appears. Choose the comment bubble , enter your comment, and then choose Save. You can edit your comment after you have saved it, but you cannot delete it from the CodeCommit console. Consider using the Preview markdown mode for your comment before you save it. To reply to comments on a commit, choose Reply. You can add comments to a comparison between branches, tags, or commits. In Repositories, choose the repository where you want to compare commits, branches, or tagged commits. In the navigation pane, choose Commits, and then choose the Compare commits tab. Use the Destination and Source fields to compare two commit specifiers. Use the drop-down lists or paste in commit IDs. Choose Compare. 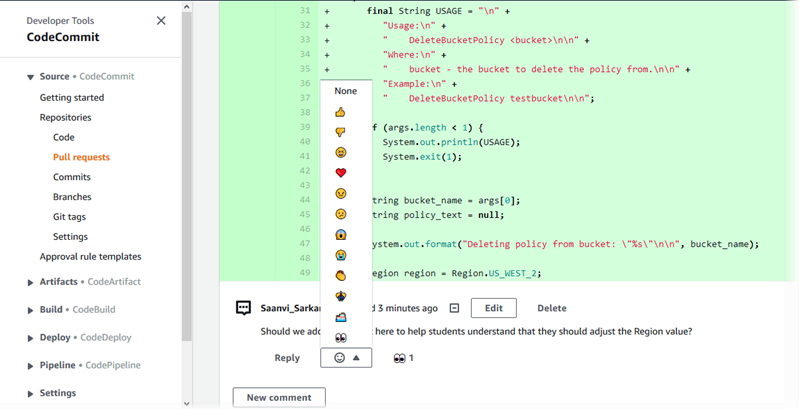 To add comments to files or lines, choose the comment bubble . To add general comments on the compared changes, go to Comments on changes. To view the comments on the comparison between two commits, run get-comments-for-compared-commit. To view details on a comment, run get-comment. To delete the contents of a comment that you created, run delete-comment-content. To create a comment on the comparison between two commits, run post-comment-for-compared-commit. To update a comment, run update-comment. To reply to a comment, post-comment-reply. The name of the CodeCommit repository (with the --repository-name option). The full commit ID of the after commit, to establish the directionality of the comparison (with the --after-commit-id option). The full commit ID of the before commit, to establish the directionality of the comparison (with the --before-commit-id option). (Optional) An enumeration token to return the next batch of the results (with the --next-token option). (Optional) A non-negative integer to limit the number of returned results (with the --max-results option). You can only delete the content of a comment that you created. A unique, client-generated idempotency token (with the --client-request-token option). The content of your comment (with the --content option). The name of the file being compared, including its extension and subdirectory, if any (with the filePath attribute). The line number of the change within a compared file (with the filePosition attribute). Whether the comment on the change is before or after in the comparison between the source and destination branches (with the relativeFileVersion attribute). Run the update-comment command, specifying the system-generated comment ID and the content to replace any existing content. You can only update the content of a comment that you created. aws codecommit update-comment --comment-id 442b498bEXAMPLE5756813 --content "Fixed as requested. I'll update the pull request." The system-generated ID of the comment to which you want to reply (with the --in-reply-to option). The content of your reply (with the --content option).